Ball Corporation is a leading provider of metal packaging for beverages, foods and household products, and of aerospace and other technologies and services to commercial and governmental customers. 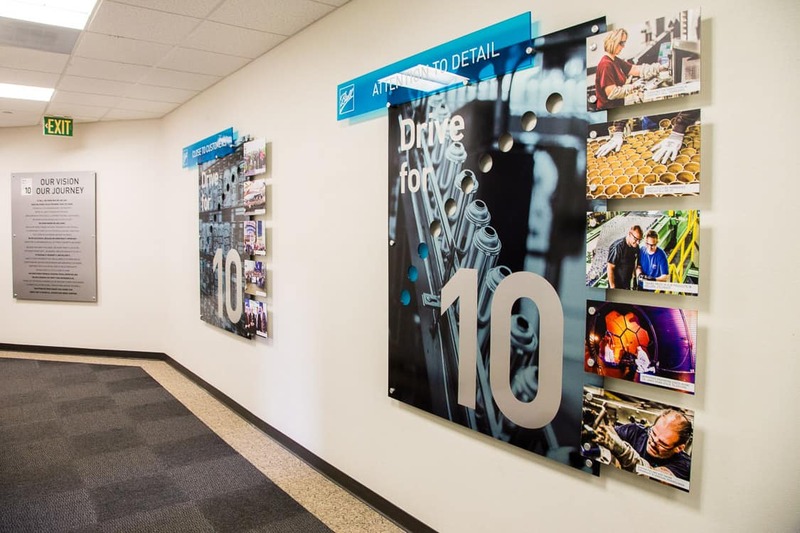 Headquartered in Broomfield, Colorado, Ball looked to add new artwork to promote their “Who We Are Month” event in September, coinciding with their “Drive for 10” strategy. Because Ball provides metal packaging encountered in everyday life, aluminum played a large part in the material choices for this project. Each area represented a different part of the Drive for 10 program, visualized through imagery from Ball facilities worldwide. Printed on a mixture of brushed aluminum and white dibond, the pods were hung with aluminum standoffs to create a dynamic, multi layered presentation, complete with printed acrylic signage. Additionally, the layout and standoffs used were designed to allow every print to be changed quickly and easily at any time.